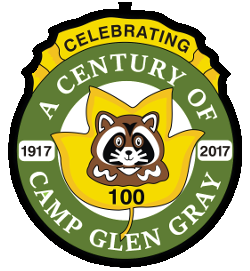 The Centennial Campfire program is a Camp Glen Gray Second Century program to encourage outdoor camaraderie and Camp spirit by all those who know and love Camp Glen Gray. The concept of relaxing around a campfire at the end of a busy day outdoors goes back to the beginning of Camp as well as our Country. If you are here to register your Camp Glen Gray Centennial Campfire container or a recent Heritage Campfire please click the Register button on the menu. In the 1700’s up and down the coast of the original 13 colonies the soldiers waging the War of Independence rested after a tiring day around their campfires. In the 1800’s as our country expanded West pioneers likewise rested after busy days of hard travel or working the land to build their future. In 1911 at Dudley Island Frank Gray and the first Scout campers from Montclair enjoyed their evenings around a campfire after a day of fun and adventure in the outdoors of Lake Wawayanda. It was from these campfires that Frank Gray established the tradition of taking the ashes from the final campfire of a season and bringing it to the opening campfire of the following camp season. This followed the Montclair Scouts to various summer camps until in 1917 they arrived at Camp Glen Gray for the first time. The first campfires were held down in Tulip Springs while the new camp was being established. The tradition of campfires ashes continued until today the spirit of all those campfires is now in the Old Guard Campfire Ring overlooking Lake Vreeland. In addition to the Campfire traditions here at Camp there are a number of other traditions related to Campfires around the world. The Girl Scouts of the United States of America have a ceremony variously called The Perpetual Campfire or The Joining Ashes Ceremony that seeks to link current members of a Girl Scout Troop to past members of their Troop as well as back to their founder Juliette Low. Some versions of this ceremony acknowledge Ms. Low's interaction with the Boy Scout Founder Lord Baden Powell. Like the Camp Glen Gray Centennial Campfire this program sprinkles previously collected ashes onto a current burning fire and remembers the many campfires those ashes represent. After the fire cools the ashes are carried forward to future campfires. A number of Scouters have their own Perpetual Campfire program where they have a container that they carry to all campfires and join the carried ashes to the new fire and then take the new fire's ashes on to their next campfire. Some Scouters have had these personal campfire linking programs running for many years starting when they were Scouts at their local Scout camps including some that camped at Camp Glen Gray. You are asked to have your campfires join in this long legacy and continue the tradition of fellowship and outdoor spirit begun by the founder of Camp Glen Gray even before the founding of his namesake Camp we all enjoy today. If you would like to join in this program you can get a Camp Glen Gray Centennial Campfire container at the Camp HQs on your next visit to Camp.